1 cup baby spinach leaves. Brown eggplant in skillet coated with cooking spray. Cook turkey and mushrooms in skillet, until browned. Stir together cottage cheese, Parm & herbs; season with salt and pepper. 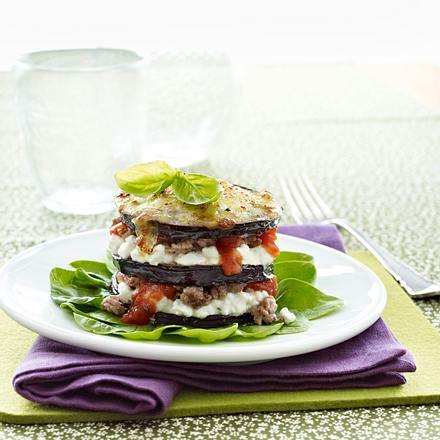 Place eggplant on greased baking sheet; top with cheese mixture, turkey, and cover with sauce. Top one stack with mozzarella. Bake in 400ºF oven 5 min, or till cheese melts. Stack slices, with cheese topped slice on top. Serve with spinach.